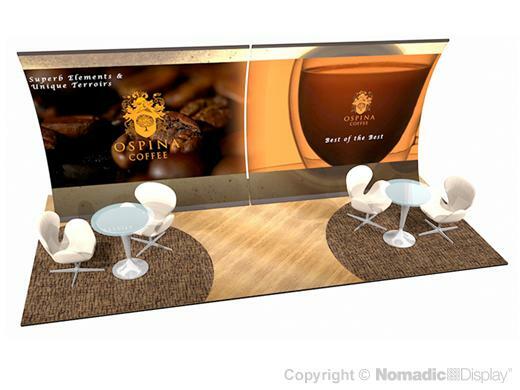 Big and bold, FabLite is also our most affordable 20’ portable trade show display. Simply clamp two 10’ FabLite displays together side-by-side. With the vertically curved frame completely encased, your audience can focus on your brand’s message. Custom-tailored to fit and provide a smooth finish, each graphic pillowcase is printed on the front side and features black fabric on the back for opacity. Tube frames quickly snap together without tools. The pillowcase dye sub graphic pulls down over the frame and zips closed. Presto – you’re ready to show! This 20’ FabLite display packs in one RollOne case with a set of lights and a premium counter conversion kit. FabLite tube frames are so sturdy we back them for a lifetime of use against manufacturing and materials defects.